Moser’s Ph.D. research shed light on different insects that create galls on hackberry (Celtis occidentalis) trees. Photo by Stacy Blomquist, USFS. 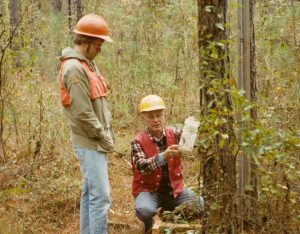 A USDA Forest Service research scientist extended his 50 year legacy by donating more than a million dollars to each of his alma maters. John Moser’s research focused on understanding the biology of town ants (Atta texana), phoretic mites, and other associates of ants and pine bark beetles. Moser received his undergraduate and graduate degrees in entomology from Ohio State University and his Ph.D. from Cornell University. 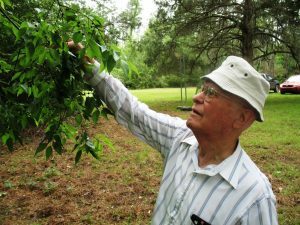 His career as a scientist spanned more than five decades, until he passed away in 2015. He and his wife, Martha, who died in 2005, wanted to give back to Moser’s alma maters that had ignited his passion for entomology. “John Moser has become an international authority on town ants,” said James Barnett, on the occasion of Moser’s retirement. Barnett, SRS emeritus scientist, is also the lead author of Town Ants: The Beginning of John Moser’s Remarkable Search for Knowledge. Moser checks a trap for pine bark beetles. His research focused on understanding the biology behind the transmission of tree diseases and tree-killing beetles. USFS photo. The report describes Moser’s remarkable career and the significance of his half-century of work with the Insects, Diseases and Invasive Plants unit. Moser collaborated with scientists around the globe to identify and understand the role of mites associated with bark beetles and other forest insects. Moser’s research results have been applied to advance knowledge about the transmission of some major plant diseases and potential biological controls for forest insect pests. Twenty species have been named in Moser’s honor — including mites, a beetle, a fungus, a fly, and an ant. The Mosers’ donation will endow a special chair for professors at Cornell University and Ohio State University. 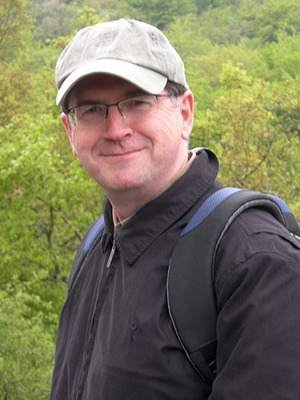 Moreau’s research includes ant-insect macroevolution. Photo by Roberto Keller Perez, courtesy of the Field Museum. 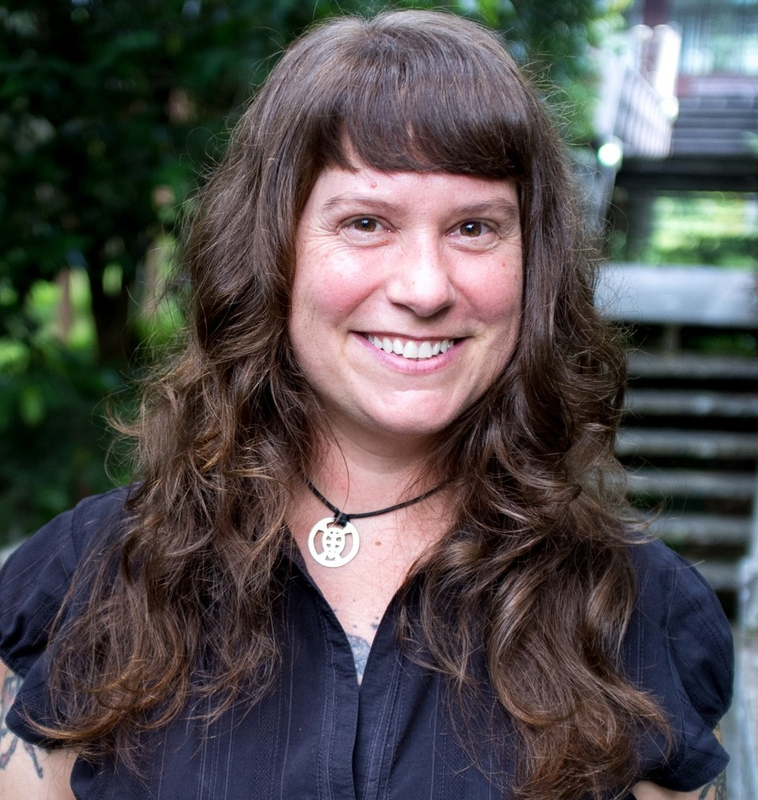 The Cornell University recipient is Corrie Moreau, a Harvard graduate who currently serves as the Director of Integrative Research and Associate Curator and Professor at the Field Museum of Natural History. Her research interest is in the origin and evolution of species — in particular how symbiosis influences patterns of diversification. In 2019, she will being work at Cornell as a professor of entomology, ecology, and evolutionary biology. Johnson’s research includes discovering and describing new species of wasps. Photo courtesy of the Johnson Systematics Lab, Ohio State University. At Ohio State University, Norman Johnson is the recipient of the Arthropod Systematics and Biological Diversity chair. A Cornell University graduate, he conducts research on the systematics of the Platygastroidea, an economically important and biologically fascinating group of parasitic wasps. Johnson will lead a multimillion dollar project with a team of 13 participants from nine countries to conduct extensive field work around the world. Read about current research on insects, diseases, and invasive plants. For more information, email Stacy Blomquist at sblomquist@fs.fed.us.